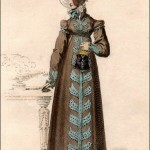 Fashions of London and Paris, June 1800. Even though this was an inexpensive little magazine, it nevertheless often managed to embellish its prints with silver or gold metallic paint. The full dress on the right is described as trimmed in silver, as is the bandeau, and yet no metallic paint was used. Dark charcoal gray paint was used instead. Were they perhaps cutting back on expenses (metallic paints were more expensive), or did they simply run out? It is also unusual that neither model is wearing gloves, though both walking dress and full dress would have required them. Note that the parasol on the left is held by the tip, as it is in most fashion prints of the period, and not by the handle. “Fig. 1. Walking Dress. Coloured Chip Hat, tied under the chin, and ornamented with flowers in front. 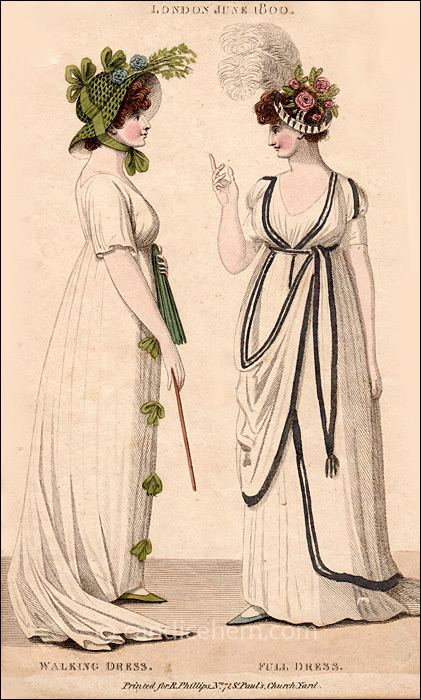 Dress of white muslin made and worn very low in the neck and bosom, and fastened down the front with rows of ribband. The sleeves loose.